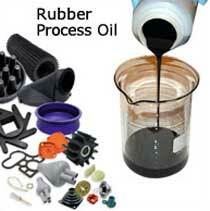 We are one of the leading manufacturers and suppliers of Rubber Process Oils in India. When the search is aimed for the best suppliers of Rubber Processing Oil, then our name comes first. All of our Rubber Processing Oil is manufactured with utmost care and precision ensuring that our products are optimum in quality and they cater to the exact demand of our clients. DRACO 410 Black Coloured Rubber Processing Oil recommended in Cycle Tyres, Automobile Parts and Other Black Coloured Rubber Goods. ARISTO 710 :- Aromatic in Nature, Heavy viscosity Mineral Oil, recommended for Auto Tyres, Tubes, Tyre Retreading Materials, Conveyer and V-Belts, Hard Rubber Battery Containers and Auto Rubber Parts etc. POLLUX 40 :- Light coloured Naphthenic Oil for Microcellular sheets, Sports Goods Hot Water Bottles, Tubes, Hawai Chappal and other rubber footwear etc. ARISTO 541 :- High Quality Naphthenic Rubber Processing Oil, recommended for manufacturing of light coloured Tyres, Mats, Footwear, Straps, Molded and Extruded goods. ARISTO 245 :- Light coloured Paraffinic Rubber Process Oil, recommended for light coloured rubber goods like TPR Footwears, EPDM, Hot Water Bottles, Tubes, Hawai Chappal and other rubber footwear etc. SUN SOFT Y :- Light Yellow Coloured Petroleum Jelly for Hawai Chappals, Sports goods etc. SUNSOFT W :- White Petroleum Jelly for light coloured rubber goods. Used in Hawai Chappal, Sports Goods and Automotive Parts.